Pradosh Kal Bela is your local time of 2 hours 24 minutes after sunset. Deep Dan and Laxmi Puja is considered auspicious during this time. Dhan Teras (धनतेरस) falls two days before Diwali. The word "Dhan" means wealth and "Teras" means 13th day of lunar fortnight. God Yama is worshipped on this day to provide prosperity and well being. As such this day has a great importance for the community of North & Western India . Houses and Business premises are renovated and decorated. Entrances are made colourful with lovely traditional motifs of Rangoli rangolee designs to welcome the Goddess of wealth and prosperity. To indicate her long-awaited arrival, small footprints are drawn with rice flour and vermilion powder all over the houses. Lamps are kept burning all through the nights. Celebrations include shopping of new clothes, jewelry, new utensils, sweets and beautiful lanterns, especially for Dhantrayodashi . On the occasion, corporate and any enterprise find it the perfect time to gift their employees. Gift hampers are marked with corporate name and logo; also used for promotional handouts. As per a legend, when the gods and demons stirred the ocean for Amrit (the potion which makes one immortal), Dhanavantri - physician of the gods - who is also supposed to be an incarnation of Lord Vishnu emerged from beneath the waters carrying the jug containing the potion. According to another legend, King Hima’s sixteen-year-old son was preordained to die on the third day following his marriage because of snakebite, according to soothsayers. On the critical day, his wife illuminated the house by lighting up numerous lamps. She took out all the ornaments and gold and silver coins piled them up at the entrance of her husband's room. She related tales to the people gathered at their house and also sang songs through the night. Yama (god of death) arrived at the fated time in the guise of a serpent. However, the bright lighting in the house dimmed his vision. He couldn’t sight the prince’s chamber. So he made himself comfortable by seating himself on the pile of ornaments and coins. As he sat there, he could not help, but get enchanted by the songs rendered by prince's wife. At daybreak on the following day, he left the place with his mission unfulfilled. Thus, the wife was successful in saving her husband’s life. It became a sacred day, and Dhanteras also came to be referred as "Yamadeepdaan" . 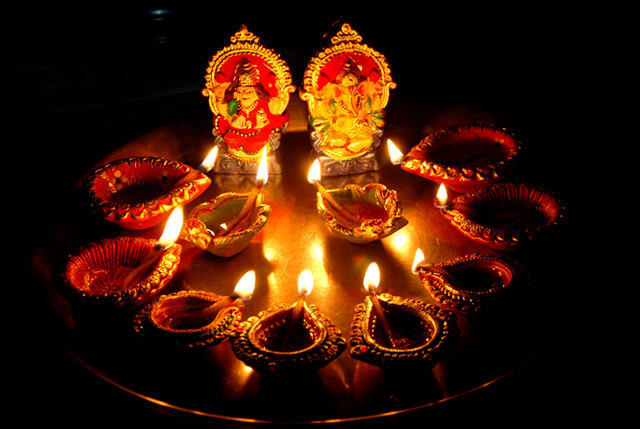 So on Dhanteras lamps are aflame throughout the night for the worship of Lord Yama. Puja & Deep Daan should be performed at Evening Time (Pradosh Kal) of the day but within Tryodashi Tithi.